Senior medical imaging technologist Sierra Westbury with the new 1.5 Tesla Magnetic Resonance Imaging scanner, which will help treat Animal Hospital at Murdoch patients in a non-invasive manner. THE Animal Hospital at Murdoch University has a new tool to call on when caring for sick and injured animals. 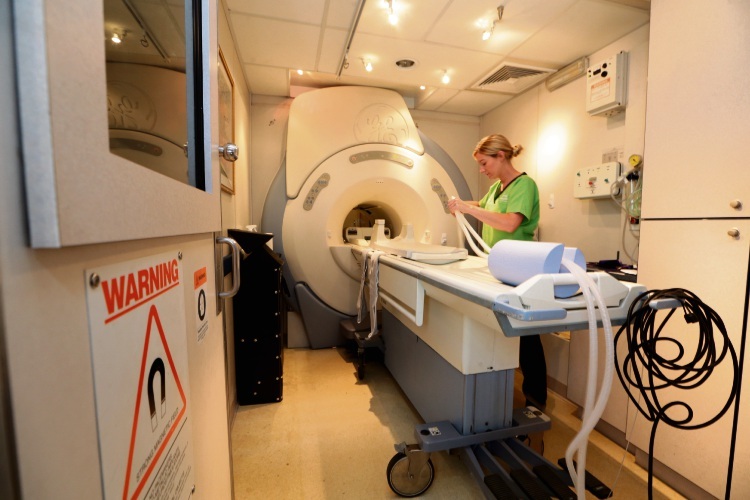 The 1.5 Tesla Magnetic Resonance Imaging (MRI) scanner allows specialists to examine the organs of pets for abnormalities in a non-invasive way. Radiologists had previously used a computed tomography scanner to examine patients. While still a quality machine, the new addition has the advantage when it comes to scanning soft tissues including the spinal cord and the brain. Nerissa Stander, a diagnostic imaging specialist who runs the MRI with The Animal Hospital, said it would mainly be used to detect neurological conditions. “We can also use the MRI to make tumour evaluations in cancer patients and examine ligaments and tendons for injuries,” she said. “MRI is non-invasive and requires the animals to have a general anaesthetic before scanning so they do not move in the machine. The Animal Hospital said it was the first veterinary business in WA to acquire and operate the scanner.